Puzzles come disassembled in a designer box with photo on top. The 10x14 252 Piece Puzzle in a designer box with your photo on top. Great gift for kids, grandparents, bridesmaids, birthdays and anniversaries. 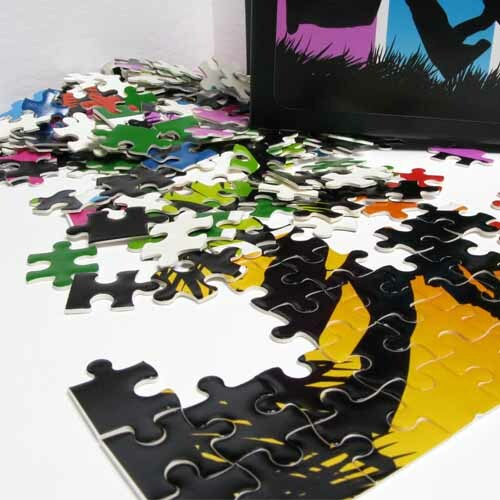 Puzzles come disassembled in a designer box with photo on top. Recommended Image Dimensions: 7.5 x 9.5"
30 Piece Photo Puzzle w/ Box: Put your artwork or photo on a puzzle to create a custom gift item that everyone will love! Puzzle pieces provided in a 5x7 box. Artwork is displayed on box top behind clear lid for box. Has a matte velvet finish. 30 Piece Photo Puzzle w/ Box: Put your artwork or photo on a puzzle to create a custom gift item that everyone will love! Puzzle pieces provided in a 5x7 box. Artwork is displayed on box top behind clear lid for box. Has a matte velvet finish. 110 Piece Photo Puzzle w/ Box: Put your artwork or photo on a puzzle to create a custom gift item that everyone will love! Puzzle pieces provided in a 5x7 box. Artwork is displayed on box top behind clear lid for box. 110 Piece Photo Puzzle w/ Box: Put your artwork or photo on a puzzle to create a custom gift item that everyone will love! Puzzle pieces provided in a 5x7 box. Artwork is displayed on box top behind clear lid for box. Recommended Image Dimensions: 10.5 x 13.5"
252 Piece Photo Puzzle w/ Box: Put your artwork or photo on a puzzle to create a custom gift item that everyone will love! Puzzle pieces provided in a 5x7 box. Artwork is displayed on box top behind clear lid for box.